Stories are powerful. Inspiring stories of local people are especially powerful. Any good marketer will tell you that the most important element of your marketing strategy is how you tell your story. This can sound like a lot of fluff to the average business person. And, we’d even agree that too many marketing agencies only focus on the warm and fuzzy elements of brand and story, without using analytics to drive results. This is why we have a strong focus on ROI. After all, you have to track and ensure your marketing tactics are working. Getting leads that actually convert into new client registrations is an essential part of any agency’s job. It’s when those two come together – powerful story-telling with data-driven decisions – that the magic happens. Here are a few examples from some of our clients. 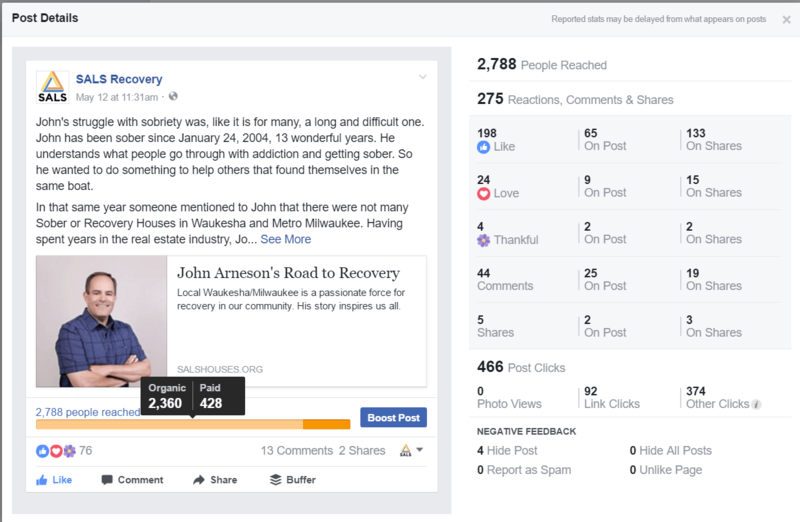 Take a look at this post that we starting running just last week that tells the story of the founder of SALS Recovery & Housing. 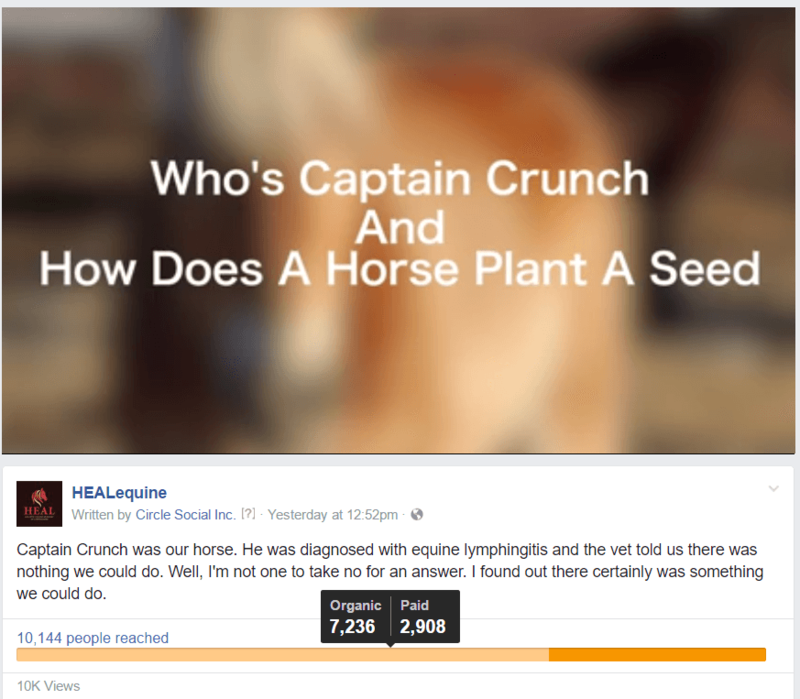 Note: For those not familiar with Facebook campaigns, the light orange is organic reach. That means that it’s FREE. 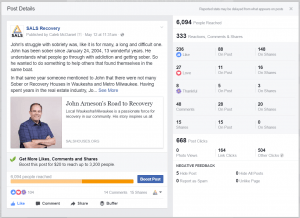 When a post is highly engaged with by the community – likes, shares, comments – then Facebook promotes it for our for free. The dark orange is what you actually had to pay for. This post was less than 12 hours old and had already racked up 131 reactions, 2 shares, and 37 link clicks! Amount spent at that point? Only $7! What do you do when you see a rock star ad like this performing so well? You want to put some money behind it and amplify it to the community. So we pumped another $55 into the campaign over the next few days. By today, just 3 days later, we have an additional 2,000 organic impressions, 130 more likes, 13 more likes, and a whopping 120 more link clicks! As all of these link clicks were going to website pages with contact forms, SALS got flooded with new leads. 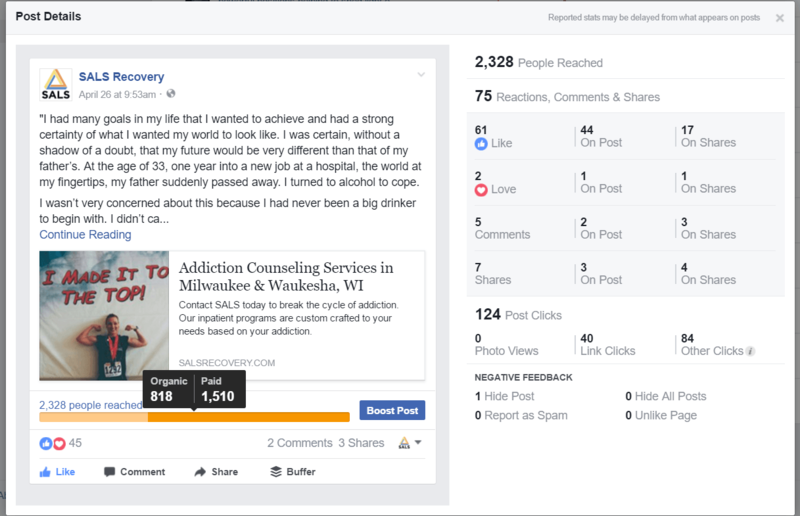 For a recovery center where each new client brings can bring in up to $1,000 a month in revenue, that’s an amazing ROI for a total of a $63 ad spend. What was it about this ad that made it so powerful? It was the story of a local man in their community. 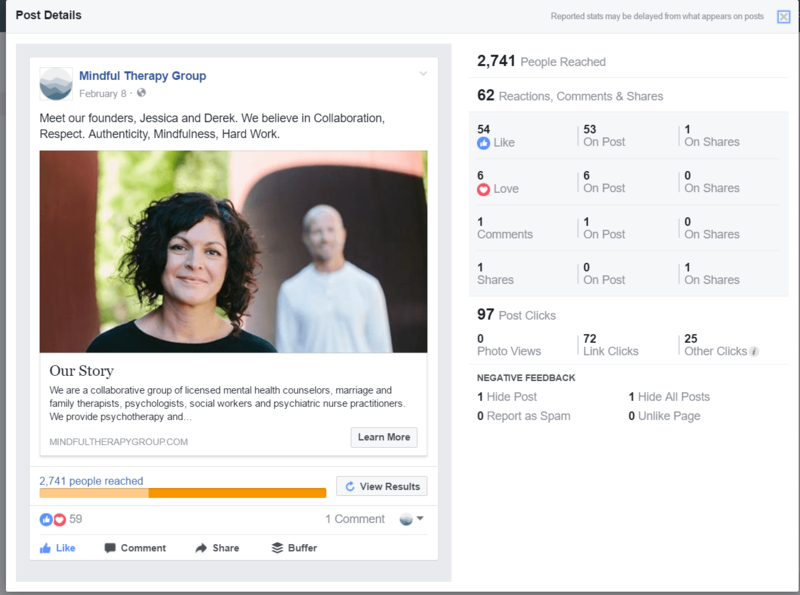 So many therapy centers, and businesses in general, push out content about their services, specials they’re offering, or more informational articles on an individual’s needs. These are boring and people don’t care. Here at Circle Social, we know that people engage with people, not companies or organizations. That’s why we take the time to find out the stories that matter to the community and work with both members and clients of those organizations to tell and share their stories. The story above is about the founder of SALS. However, stories from community members are just as powerful. Through our Twitter outreach, we had connected with several influential community members and bloggers in the addiction recovery space. After getting to know them, we ask them to share their story as well. Simone is one such example We asked her to right up her story for us, which we then added as a guest post on our blog and used in one of our digital ad campaigns. It cost just a bit less than John’s at $50 and wasn’t as popular, but still great reach and engagement. A total of 63 reactions, 7 shares, and 40 post clicks that, again, got the phone ringing. These tactics work with any kind of locally based therapy organization. Of course, the stories alone won’t get the results. You still have to set up your targeting, back-end analytics & optimization, and split-testing, but it’s an excellent place to start. Here is an example from a Seattle-based center that focuses on mindfulness. Rather than tell a long story, we simply focused on the values of the founders at first. With a $28 spend, we got an amazing 72 link clicks. We then followed this up with a retargeting campaign detailing more of the story, but running the campaign exclusively for lead generation. Because this was a retargeting campaign where we’d already built up trust, these were high quality leads. For $30 a lead, we got 3 new clients. With the average client spending about $800 a month in services, this was another amazing ROI. And this doesn’t just work with people-centered businesses. Another one of our clients is a horse therapy center. With a nice 1-minute video that highlights the owner’s story of wanting to help her horse, we again get spectacular results. This video had over 10,000 views within 24 hours! The cost for that many views? Just $40. This allowed us to build up a huge back-end audience for video views retargeting that we then used to build out their webinar funnel and other campaigns. Because of the power of the stories being told in all of these campaigns, we were able to make huge gains in organic reach and engagement for free! The average cost per thousand impressions (CPM) on Facebook is anywhere from $10 to $60. For HEAL Equine, they average around $12. If we had had to reach that same 10,000 people and pay for them, it would have cost us over $120. Instead, we got the same result for just $40. And, of course, those ads start paying for themselves once the clients start coming in. For most therapy centers, the lifetime value of a client is somewhere between $5,000 and $10,000. Just starting off with minimal ad spends of $1,000 per month, it’s quite easy to gain somewhere between 2-5 new clients each month once campaigns get rolling. That’s a pretty serious return on investment and that doesn’t even take into account the long-term brand building value that comes with it. So now the question remains, what’s your story? And would you like us to help you tell it? We use some of the techniques mentioned here and many more to regularly drive upwards of $10,000 a month for many of our clients. We’d be happy to do the same for you. Fill out the form directly below and we’ll be in touch.